It all started when I was tagged to a facebook post which read “Her studies led her to develop a new technique called “dance isolation,” which involves moving one part of the body while all other parts remain motionless, "Katherine Dunham, inventor of twerking and tip drilling.” While I asked the person to take the post down, I also realized that it was really intended for me to see it in the first place. Hmm, what would Dunham say about twerking? I immediately directed myself to Miss Dunham’s master’s thesis, “Dances of Haiti” first published in Spanish in 1947; in French in 1957; and finally in English in 1983. What I explored was her glossary, specifically those terms relating to dances or physical movements that could in some way be seen in modern twerk techniques. This is not a shoddy attempt to devalue Miss Dunham’s name and work by any means. 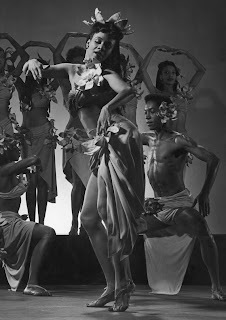 In fact, from what I’ve studied about Katherine Dunham and from stories I’ve been told by people who have studied under her, Miss Dunham could pull greatness out of anyone. This was one of the very reasons why she chose East St. Louis as her home in the 1960s. She wanted to help at-risk youth and young adults by teaching them about their history and culture and through the arts she wanted them to find value not only in themselves, but also in their community. Miss Dunham had a lifetime of experience navigating various socio-economic and ethnic boundaries. However, much of her repertoire stems from those dances of the underprivileged and marginalized people of color. Twerking, as a modern dance, has evolved from earlier dances, many that Dunham and her predecessors were familiar with, but because of Dunham’s anthropology and dance background she was in a better position to document, define, interpret and choreograph such techniques, thereby establishing her own dance pedagogy. For the informally trained dancer, there is no model. There are no notations or examples (with the exception of music videos and the now the internet). Still, what is clear about twerking is it is a dance form derived from urban/street dancing, nightclub venues and a working class environment. Danielle Hall is a program coordinator and contributing writer for Black Studies @ SIUE.